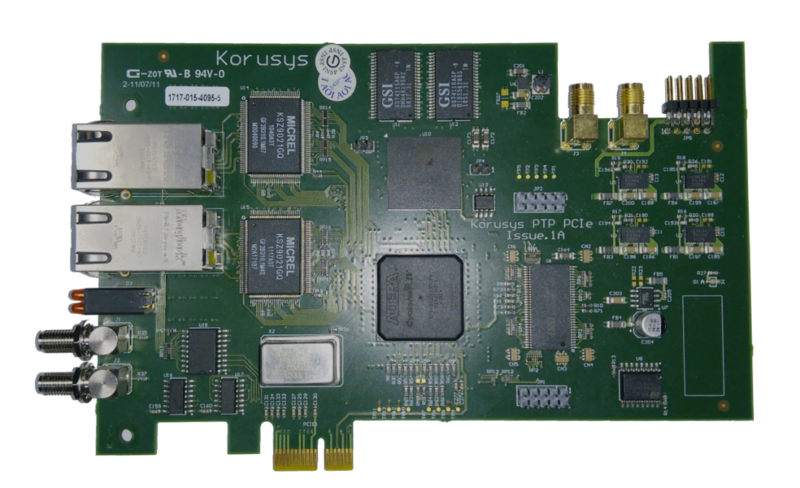 The Korusync IEEE1588 PCIe card brings telecoms quality synchronisation to High Frequency Trading, Telecom, Test and Measurement, and Industrial marketplaces. It is delivered with a suite of applications that deliver the card’s time, highly accurately, into the Linux system. The Korusync IEEE1588 PCIe Card is a class leading synchronisation solution for PC’s and Servers, based on a PCIe card platform and associated software tools. Highly accurate time is acquired by the Korusync card via network communications utilizing the IEEE1588-2008 protocol. The card is fully IEEE1588 v2 compliant and supports the Telecom profile for enhanced performance. The use of class leading timing recovery algorithms, an oven controlled oscillator and the Korusys timing toolkit software means that the Korusync PTP card can provide time, internally to the Server software applications, to better than 100ns of accuracy. A software app that provides ultra low latency access to super-accurate time by replacing the heavyweight Linux system clock with a lightweight, scalable and nanosecond accurate software clock. A software app that allows the user to provide super-accurate timestamps to events inside the user application space and to have these forwarded and logged in an ultra lightweight manner. It allows visibility of intra core transactions at the software level to help tune and monitor the performance of Trading algorithms. The Korusync IEEE1588 PCIe Card is offered as a package of both the hardware capable of establishing an accurate time, and software drivers/applications to extract that time to the host system. There are a limited number of these cards remaining so if interested in purchasing please contact us via phone or email. Recovered Time Accuracy Better than 100 nS accuracy in unloaded networks. Better than 1 uS accuracy in heavily loaded networks. SMA 0 – One pulse Per second Output. LVTTL levels, Rising Edge aligned 1uS high period. Software Support Drivers: Linux RedHat 5.5, 6 32 or 64 bits. Other O/S builds available on request.